It went off the air for the last time on June 7, 1955. Here’s to Lux Radio Theater. To everyone from me and Cecil B. DeMille a hearty welcome! These words introduced broadcast radio’s biggest and most important dramatic program. For two decades, The Lux Radio Theatre presented radio versions of movie attractions, current or coming, while the biggest names in cinema played the leading roles. 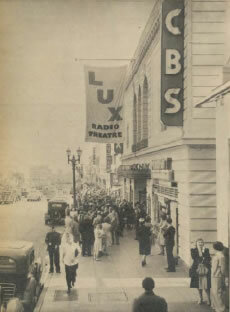 The Lux Radio Theatre debuted in 1934, dramatizing Broadway plays from New York. 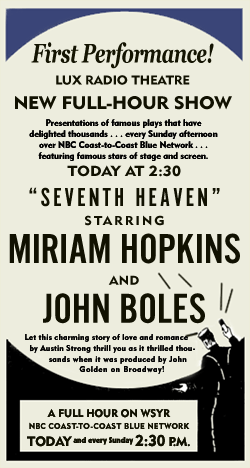 The premiere show was an adaptation of “Seventh Heaven” starring Miriam Hopkins and John Boles. In an effort to improve ratings, the show moved West in June 1936 to capitalize on Hollywood talent and popular movie fare. Lux’s extravagant productions were a huge success. Renowned director Cecil B. DeMille—whose films were synonymous with spectacle—was brought in to host the show. Before the show left the air in 1955, DeMille—and subsequent hosts William Keighley and Irving Cummings—welcomed nearly every major movie and radio star to the Lux microphone, including Cary Grant, Claudette Colbert, Ginger Rogers, Bing Crosby, Katherine Hepburn, Humphrey Bogart, Judy Garland, Roy Rogers and Bud Abbott and Lou Costello. Adding enjoyment to each broadcast were the interviews after the shows, which often featured these great stars in candid moments not available through on mediums. Lux Radio Theatre went off the air for the last time on June 7, 1955 and was inducted into the Radio Hall of Fame in 1989. And finally, to the shows. Following are three Lux Radio Theater productions from starring a few fairly fabulous motion picture stars. Enjoy. This is a fond remembrance to Lux Radio Theater. I recently took a long road trip the best part of which was listening to these old-time radio gems, a favorite pastime. Long live Lux. Great post and pictures. How lucky folk were back then and how lucky we are that we can listen to so many of the great radio shows like Lux Radio Theater. Thanks and YES INDEED! I love finding new gems to listen to. Stars in roles that we only picture others doing and those candid moments. Also, for the most part the stars sound like they had such a blast doing these. So glad you enjoy them as much as I do! This series was so well done. I sometimes catch it in the car on Sirius. Cecil was the perfect host, in my opinion. Wonderful tribute! Happy Birthday, Lux Radio Theatre! WOW – I didn’t know they had these old radio shows on Sirius. I’ve resisted subscribing because my iPod is filled with my favorite music and some old radio shows I’ve downloaded. But that may be the deciding factor! Sirius channel 82, Radio Classics. My faves are The Jack Benny Program, Suspense, and some of the old Gangbusters shows. They have the programs on a rotating weekly schedule. I love ’em for longer road trips. I think I may get it it then. A hell of a lot easier than downloading the OTR shows on the iPod! What a wonderful tribute to what’s become one of my favorite listens this year. Thank you for these! Thanks, Sarah. So glad you’re enjoying these. “Dulcy” is the only surviving episode from Lux’s New York period; most of the Hollywood-based episodes are available. For a contemporary look at “Lux,” go to http://carole-and-co.livejournal.com/619551.html. OH! I didn’t know only one survived! You have an amazing website! I found it when I was searching “Buster Keaton films” and saw your review of Convict 13. My grandfather was Big Joe Roberts and that is one of my favorite short films. I also saw your postings for Lux soap under radio programs. After Big Joe passed in 1923, my grandmother, Nina Roberts was employed at United Artists studio as the chief hairstylist. She was interviewed and promoted Lux soap during a commercial break in the “Dark Victory” radio series. OH MY!! Thanks so much for the visit and kind words. I’ll be sure to listen to that “Dark Victory” broadcast again soon. Big Joe Roberts was wonderful.